Disclosure: I received a free copy of this book to review, but no other compensation. My opinions are my own. 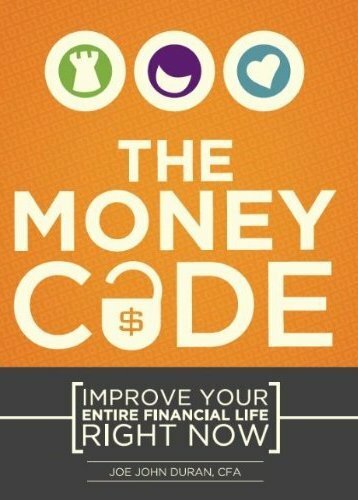 In The Money Code, Joe John Duran posits that there are three "money minds" which control the default ways in which we spend, save, and think about finances. If you can identify your money mind, you can use its strengths and be aware of its deficits in order to make better money decisions and have more productive conversations. It's sort of The Five Love Languages for your bank account. Drawing inspiration from The Behavior Gap (see my review here), simple line drawings help illustrate larger concepts, like how to narrow down what you worry about to those things you can control and the intersection of good decisions. The main points of the book are repeated throughout, emphasized in different case studies and with different scenarios. Determining your money mind is possible with questions from the book or a well-executed quiz available on the companion website, MyMoneyCode.com (link directly to the quiz here). Once you've learned whether you are a protector, a pleasure-seeker, or a giver, it's easier to determine why you keep making the same mistakes with money over and over again. I am very definitely a protector. I need a safety net. I am able to be disciplined about saving money, avoiding debt, investing conservatively, and living within my means. However, I also frequently deny myself large or even small pleasurable treats, I have been selfish with money rather than giving, and I am much more likely to fear losing money, thus missing out on opportunities. Knowing how I am likely to act with money can allow me to overcome some of those downsides to being a protector, and use money to enjoy life as well as safeguard my future. The same understanding is given for the other two money minds, along with tips about how to interact with people who have a different money mind that you do. The biggest downside to The Money Code, in my opinion, is the parable format in which the material is presented. We follow Jack through his encounter with a strange man called The Alchemist who gives him computer lessons and then a one-hour therapy session on a ranch. The lessons and talk therapy impart the components of the money code, use illustrative case studies, and conclude with questions to ask yourself. I found this convention goofy and distracting - it's a lot of filler around some really good food for thought. That said, I think The Money Code is worth a read if you keep making the same financial mistakes (or even just sub-optimal decisions, like feeling stingy all the time) and can't quite figure out why. It's not prescriptive as much as descriptive - you'll have to figure out how to apply the knowledge to your own life - but it's a fresh, interesting look at our motivations. Looks like a good read! Definitely adding it to my list! I'm fear focused! Not surprised! Very interesting.